In a world obsessed with doing everything, the #domesticphd is our attempt to do just that. Juggling academic life, and trying to do what we love- eating and cooking. But mostly eating. The #domesticphd had its original kickstart as a Masters, a PhD, and a RD degree ago. While taking time out of our busy grad school commitments and swapping advice on everything from academic woes to our favourite shampoo brands, we discovered a common passion: we are foodies! Four years later and here we are. Food lovers. Baking champs. Nutrition geeks with all of the credentials. Join us as we turn our formal education into a gastronomic adventure! Just like life, the kitchen is a messy place. Expect the #domesticphd to be a wonderfully messy adventure as well. 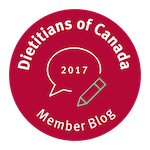 We will concoct new recipes, share our favourite tried and tested, with a healthy side of evidence-based nutrition research. Our philosophy is simple. All foods fit. In moderation. Eat the food you love with the ones you love. Thanks for stopping by the #domesticphd! We hope it inspires you to get into the kitchen, try something new, and use simple ingredients to create delicious (and healthy) eats!